More than 400 jobs are set to be lost in east Kent after pharmaceutical firm Pfizer announced it was closing its manufacturing arm in Sandwich. The company said the move was the result of ongoing consolidation of its global manufacturing operations. Pfizer has also cut jobs in sales, and research and development (R&D), since 2005. Local MP Stephen Ladyman called the latest losses "dreadful news". Its European R&D headquarters remain in Sandwich, employing 3,500 people. Pfizer, which has its UK business headquarters in Surrey, said the end of manufacturing in the town would lead to about 420 redundancies, phased in over the next two years. Tony Maddaluna, vice-president of Pfizer Global Manufacturing, said: "It is with regret that we announce our decision to end manufacturing operations in Sandwich after 53 years. "This is the latest in a number of global manufacturing changes, to ensure we are operating as efficiently and effectively as possible." Pfizer said it would work closely with other bodies to "mitigate the impact on colleagues and the local community", especially offering support for redeployment or re-training. Mr Ladyman, Labour MP for South Thanet, said: "I know Pfizer will do its best to redeploy as many people as possible, but that will be little comfort to those who will lose their jobs. "The hard-working men and women have made a massive contribution to the growth of Pfizer... and this is no way for the company to treat them." 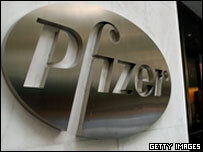 Pfizer said the closure was no reflection on the performance of a "talented and skilled workforce".